I'm blessed with several very good friends who live in Hawai'i and who are willing to tolerate me as a house guest for extended periods of time. Many of the scenes in my books are inspired by these visits. So, in celebration of the release of A TOUCH OF THE PAST, I thought I'd share a few of the pictures from behind the scenes. About mid-way in PAST, Everly chases after the villain, and finds herself in one of the less-populated recreational areas of Honolulu, Sand Island. On the day I was there, it was almost deserted, rain threatened, and it had the quietly creepy feeling, like something bad was about to happen. The air was heavy and smelled industrial, slightly chemical, and moist. Cloying. "I found pictures of the watchtowers on the Internet. I thought I’d hide in one and see who showed up. Maybe get a license plate number for you to trace." We hiked for a good ten minutes, Pierce doing his thing—watching every direction at once, keeping me in his sight, and his hands loose. My sneakers smacked against the damp grass with a swishy, sucking noise that defined every step. He moved silently and faded into the wind—a wisp of energy that dissolved into the dark, practically nonexistent. 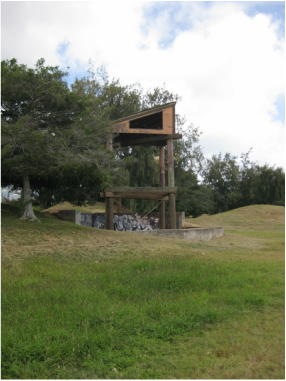 I spotted a structure that offered a good view of the surrounding area and headed toward it. "There, maybe." The wind, scented with the promise of rain, tugged at my hair. I shivered. Pierce edged close to me, the front of his body barely touching my back. Warmth seeped across the space between us, and he tapped my shoulder—a signal to stop. "Bad choice. I’ll boost you into that tree." Tree? So stupid to have worn shorts. My already scratched legs wouldn’t fare well with tree climbing. I planted my feet. "Why not the watchtower. It would be easy to climb up the support structure, and it has those nifty open slats overlooking—"
"Crumbling concrete. Unstable and too obvious." Tension radiated through his fingers as they hit the small of my back with a thump. "Move. Now." I ran toward the tree, and Pierce had me wedged onto a shoulder-high branch before I caught my breath. "Climb." He pointed to a sturdy niche several feet above me. By the time I’d angled into a comfortable position, he’d disappeared into the night.